Ron Crowe wasn't hitting as well as he thought he could at Cal Poly San Luis Obispo, so he turned to his batting stance, according to The Los Angeles Times. The result in this April 1989 game: Five runs batted in and two runs scored. "It was one of those days every ballplayer hopes to have," Crowe told The Times afterward. 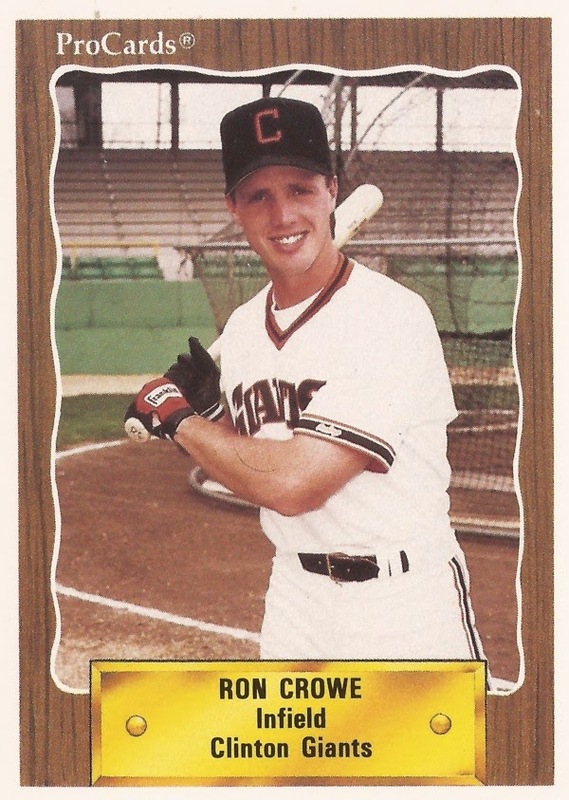 Crowe went on to have enough of those days to turn pro and eventually make it to AAA. He never had enough to make the majors. Crowe's professional career began that June, taken by the Giants in the 38th round of the draft out of Cal Poly. At Cal Poly, Crowe helped his team to the Division II championship, hitting 11 home runs and picking up 57 RBIs. Crowe played his first year with the Giants at short-season Everett. He hit .275 in 69 games. He hit a two-run home run in a June game. He knocked two doubles in a July contest. He moved to single-A Clinton in 1990, hitting .280. He then played 1991 at high-A San Jose, hitting .290 there. Crowe made AA Shreveport in 1992, playing 81 games there. He also got nine games at AAA Phoenix. He hit just .238 between them. He returned for one more season in 1993. He got into just 42 games back at Clinton and San Jose, ending his career.